For more than a decade, the Academic Performance Index has defined the public’s perception of a school. But now the API’s power – some would call it tyranny – is waning. In the near term, the API will be a husk of its former self and may disappear for a couple of years. Longer term, it will become just one of many gauges of school performance – demoted from sheriff of accountability to the rank of sergeant. The passage of Assembly Bill 484, sponsored by Assemblywoman Susan Bonilla, D-Concord, on behalf of State Superintendent of Public Instruction Tom Torlakson, suspends most of the standardized tests that had been given annually from grades 3 to 11, with no timeline for replacing many of them (see accompanying story). In 2014, AB 484 requires that districts give a preliminary or “field” test in the Common Core standards – new, nationally aligned learning goals the state is implementing – instead of tests on state standards in math and English language arts. A field test provides valuable information to the test’s creator – the Smarter Balanced Assessment Consortium, in this case – but not valid scores for comparing schools or students. As a result, for the first time since API was created in 1999, the State Board is likely to vote to suspend it next year. And the Board could decide to suspend the API again in 2015, on the grounds that there needs to be at least a couple of years of results from the official Common Core tests for math and English language arts before starting to judge schools by them. Even before AB 484 scrambled the state standardized tests on which the API is calculated, the API was facing a makeover. It took Senate President pro Tem Sen. Darrell Steinberg, D-Sacramento, two tries to convince Gov. Jerry Brown, but in 2012 the governor signed Senate Bill 1458, which requires building in other measures besides standardized tests into the API. Starting in 2016-17, at least 40 percent of a high school’s API score must include indicators of college and career readiness, such as graduation rates, dropout rates or the proportion of students who graduate with courses required for admission to University of California and California State University. (The State Board will determine which factors to include.) SB 1458 allows non-test measures to be introduced into elementary and middle school API scores as well. With a point system of 200 to 1,000 points and a target score of 800, the API has been weighted heavily toward the results of state English language arts and math tests. Those two subjects comprised 90 percent of a K-8 school’s API last year, with social studies and science making up 10 percent. For high school, math and English language arts tests in grades 9-11 made up 45 percent of the API, with end-of-course science tests next at 23 percent, history and social science at 14 percent, and scores on the high school exit exam the remaining 18 percent. SB 1458 encourages giving more weight to social science and science tests in response to the widely shared criticism that a math- and English-heavy point system had discouraged K-8 teachers from making time for other subjects. SB 1458 takes the view that the API should be mended to incorporate broader indices of a school’s performance. The Local Control Funding Formula, the new school financing system that Brown pushed and the Legislature passed this year, takes this one step further, while doing an end-run around the API. The funding law’s new Local Control and Accountability Plan (LCAP), which every district must adopt as of July 1, lists eight priorities that schools and districts should be judged on and school funding should be aligned to. API scores are one of a half-dozen indices in just one priority – pupil achievement. 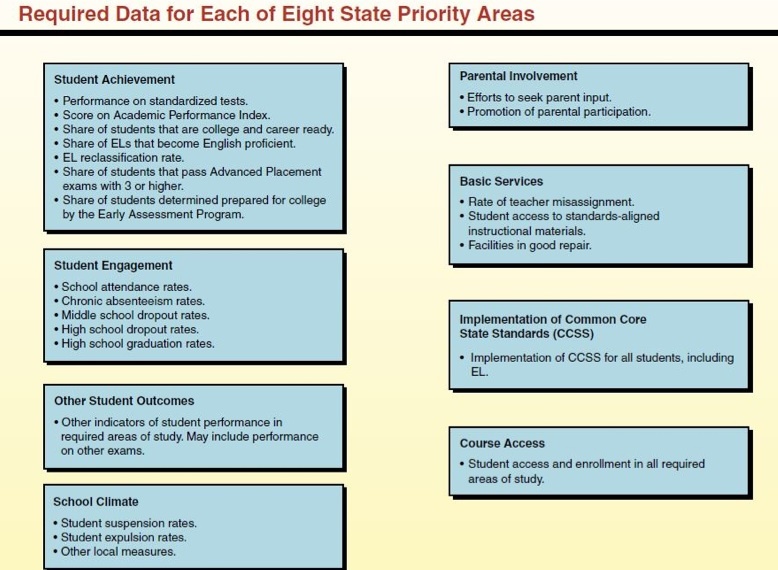 Other achievement measures include the English learner reclassification rate, the percentage of students in a school who pass Advanced Placement exams and the percentage of students who graduate college ready. The other priorities include school climate, pupil engagement and implementation of the Common Core standards. Michael Kirst, president of the State Board of Education, which will create the template for the LCAP that districts will use, says that the API “will morph into a broader set of measures” that local districts will use to set goals under their Local Control and Accountability Plan. The API will remain in law, but its primacy will end, he said. Sue Burr, a former executive director of the State Board and now a member, agreed. In passing the new finance system, Gov. Brown and the Legislature were thinking of “a more robust way of evaluating schools, not just a single number,” she said. Steinberg was one of the key negotiators with the Brown administrators on the Local Control Funding Formula. But the two laws aren’t fully in sync on the mechanics of the API. The funding law appears to favor presenting data as a dashboard. Just as your car’s gauges give separate readings – gas in the tank, speedometer, temperature, oil, RPMs, tire pressure – that create a composite picture of a car’s performance, the LCAP envisions a report with multiple indexes illustrating eight priorities. SB 1458 calls for shoehorning non-test measures into the API. Translating graduation and dropout rates or performance in Advanced Placement courses into a three-digit index is problematic, and it remains to be seen, with the LCAP as an alternative, how eager the State Board will be to try. But Susanna Cooper, Steinberg’s primary education consultant, said it was premature to predict the API’s demise. With some of these measures like A-G, there’s probably a sweet spot to look for. IE, 0% A-G completion is too low, and should lower your score. But maybe 100% should not necessarily be worth more than say 70%. Then you might give an asterisk for schools that substantially overperform on a measure. For example, if you did have 100% A-G completion or 100% graduation, maybe the number doesn’t go up but you give some recognition on the report for an unusually high score. I’d be surprised if any parents in my community know our school’s API off hand. I am concerned that so much change is happening at once with no understanding of how to implement it in a manner that is of use to teachers and students. We now have to deal with LCFF, WASC, Common Core Standards, with no credible system in place next year for reporting progress. I hate API. Good riddance. But, of course, I can complain about the new system just as stubbornly. AP pass rates: an incentive to keep marginal kids out of AP courses, reinforcing a kind of tracking that I hate, too. I agree with Jay Mathews, we should be trying to expose willing kids to more difficult work. The smart kids are in the AP classes, often almost exclusively Asian and White students in my world. I want more minority kids to chance it even if they drop out in the first few weeks. A to G requirements: I think my school pushes too many kids into multiple years of language and math. My unproven belief is that the main motivation for this is to buff the school’s reputation. Fewer than 25% of the students at my high school will graduate from a 4 year school. A smaller number will go to schools that require A to G. I want kids to be able to schedule wood shop or business courses or non-A to G science classes. They might find something worthwhile there that could change their lives. Instead they sleep through Advanced algebra and 4th year spanish. And don’t tell me they need another language. I’m talking about the majority of kids who remember almost nothing of these language courses after they graduate HS. Implementation of Common Core? Fie on Common Core. 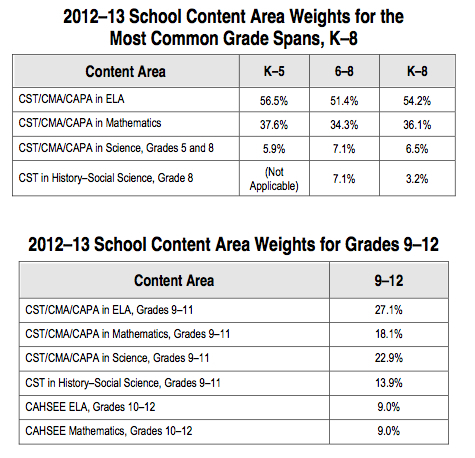 IMHO a school that was committed to the welfare of its students would be a CCSS luddite. How long before someone published a boiler plate LCFF plan that everyone will follow in the main? Good speculative post on future of CA’s API, John. I might point out two conundrums re our API system: (1) Re composition of an API, while many folks (including me) support a reduction in weight for assessment data contributing to an API, the problem is finding or developing valid and reliable measures to contribute to an API to replace the current assessment data weights. It has taken quite a few years just to get HS grad data ready for inclusion in the API, for example, tho that measure now appears to be sufficiently valid and reliable to be included. There are many suggestions to include measures that correlate or predict academic performance, but the issue with these suggestions is whether these measures really add anything beyond the the direct measures of academic performace from assessment scores. (2) Re acceptability of accountability measures like the API, polls of K-12 education folks (teachers, administrators, etc) most often reveal that a minority support having data like APIs for schools, focusing on the practical negative consequences associated with use of API data. But polls of the general population (parents, business folks, media and their readers/listeners, and legislators or high level policymakers) most often reveal that a majority of this larger group do support having accountability data like APIs for our schools. So, in some senses, the policy debate over API or API-like data for K-12 education comes down to which portion of folks interested in K-12 education to satisfy. Good points, Doug. What also complicates the inclusion of non-test data in the API are the values that policy makers choose in deciding ratios and scores. They were implicit in the API calculations, which gave more weight to moving a child from far below basic to basic on the CST results than from proficient to advanced. That was a value judgment — perfectly valid — in crediting schools for hard work in making progress with disadvantaged children. The PSAA Advisory Committee struggled with the same issue in recommending how to translate graduation rates into the 200 to 1000 point API. Should every student who graduates earn 1000 points — indicating this is a big deal — or 875 points, equal to proficiency on a CST test. Should English learners, students with disabilities and low-income kids get bonus points, say 1050, reflecting the difficulties they faced and as an incentive for schools to work especially hard to see that they earn a diploma? Doug can you comment on the scoring capability of artificial intelligence for student writing in use at Alisal High? Ann: There have been great gains in the use of artificial intelligence algorithms for scoring student writing samples in the past 10-15 years, and to trumpet local success two of the eight competitive algorithms for the K-12 application of AI scoring algorithms have been developed right here in Monterey County by private sector testing companies. But, the state-of-the-art right now is that AI scoring methods are accurate enough for instructional and low-stakes assessments use, but not yet for large scale high stakes assessment use, at least not for sole use for the high stakes environment. The new AI scoring methods can be quite helpful for secondary use, for example with human scoring providing a primary score and AI methods providing a second or confirmatory score, and then another human score used to resolve discrepancies. Whether and when machine AI methods will ever suffice for sole use for large scale high stakes K-12 tests, with great advantages for both speed and $$ efficiency, is a matter of speculation . . . .
Oh, I forgot to note that the Monterey Co Herald article discussion of use of AI algorithms at Alisal High was an instructional or low stakes assessment use . . .
What will really matter is the data the state makes available online. I hope it will be plentiful. That way people who want to think for themselves can just ignore any summary measure the state might provide. And you just made my day to suggest that SB 1458 could be dead on the vine. Good riddance API, hopefully every last bit!